When you decide and announce you are going to keep Chickens in your Garden, you can almost hear a few comments from the Neighbours about the certainty of being overcome with Rats and other pests. The truth of it is that Rats are always around regardless of Chickens and no more so if you're a keen wild bird feeder - look at Squirrels, a fellow member of the Rodent family! Having Chickens in the Garden simply means you're going to actually see them more and the only reason for this is they're hungry little blighters like any other creature. It isn't that there's a couple of Rats sitting up the road having a chat and one says to the other "Hear there's Chickens at No.49, let's go and annoy them. Rats very rarely take any notice of the Chickens and usually the two will go about their business not having much to do with each other. It's the Chicken Food which brings them out and if unattended to they will find a nice cosy house not far from the Run, often the Compost Heap, where they haven't so far to scurry along for their morning and late afternoon 'drive-in' meals. The most I've ever seen at any one time around my Run is about 12, so it would indicate there are a lot more. Because we have fields on three sides of the house they only really bother us when there's nothing else to feed upon. Usually the Rat season for us is from October to about February, or when the fields haven't anything happening to them. To be perfectly up front about it, the only way to keep the numbers down (I firmly believe you will never exterminate them all) is to cull them. This means killing a creature as there is no other way other than trapping, then letting loose somewhere miles away. Prevention is better than cure they say and the only way you will do this is by making the Chicken feed less likely to get nicked! Make sure all your feed stores are kept somewhere where Rats can't get to. A bag on the third shelf up isn't good enough, they're clever and will find a way, so put the food in a tin container with secure lid or a round plastic container with no edges where the Rat can chew through. Don't give the Chickens too much food. You'll soon get to know around about the amount they will eat before wandering off. This is the key time and when the Rats will mostly pounce. 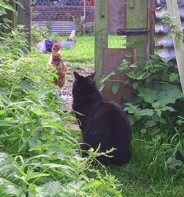 If you have time, wait around the Hens whilst they eat it. Go away a few meters, turn around and you'll see the rats popping out from everywhere! If you decide to cull, there are various ways. You can poison them, but you must be aware of loose poison pellets around which the Chickens could eat. Also your Cat maybe one of those who eats rodents after catching them. I have devised a method for this (untried) in the illustration on right. Place the poison in a biscuit tin, bury the tin underground with a pipe going down into a hole on the side. Another way is to produce a Peanut Butter stodgy mix and mould it around the middle of a bamboo stick and place on a half filled bucket. The Rat tries to navigate the stick, the stick rolls over, the Rat falls in the water etc. Personally, unless there's a real problem both in health and wellbeing, I tend to leave them alone. 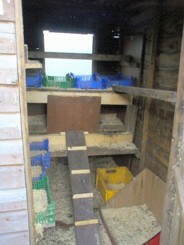 My food storage is relatively secure and I feed the Hens the minimum, but more often. I still have Rats running around, but it's not as bad as it has been. The best prevention is Cats. I have three and this lets the laws of the jungle prevail. Of course, the perfect answer to the complaining neighbour, "Well, at least they're not in your garden"! Anyone who has ever had a pet Rat will know that they are actually quite clean creatures compared to some. They're also very clever. They know their surroundings and very perceptive to what's going on around them. Like the Fox, when dealing with Rats, you are dealing with a very clever being who, at the end of the day, is living to what his and her existance is an innocent one.